Thu, August 7, 2008: Div. 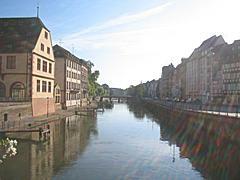 smaller tours: Zug - Bern - Zug (1 day tour). 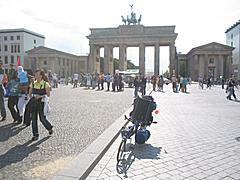 Sat, July 12, 2008: More details on France, Italy, Germany, Czech Republic and Austria after my Europe trip. Thu, January 3, 2008: More details riding in Switzerland, France and Italy. Mon, November 26, 2007: Hints on riding in Switzerland, France and Italy. Wed, November 21, 2007: More photos from travelings, and now all travel diaries online. I found another form to be for myself with traveling, instead to relate to a single place or site as home, I relate to every place as home I travel to or through, whereever I am - the more I travel the more I realize this for myself. Of course there are spots I relate faster and perhaps deeper than other places, e.g. 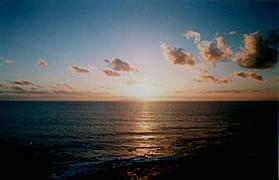 Italy and France are very dear to me and I love to travel there, as well Four Corner in the USA. Most diaries are held impersonal, I don't really describe my inner state of mind and heart - this is done intentional. 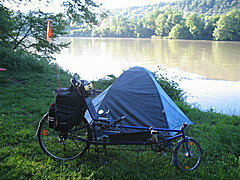 The bicycle tours I made mostly with a recumbent, a so-called "longrider" (Fateba L1). 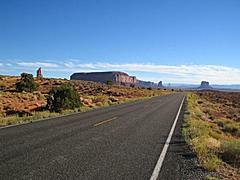 I'm also planning a USA Coast-to-Coast Tour sometime, apprx. 4800km or 3000 miles. I'm often now cycling aside of the official cycling roads but on the streets which often have a cycling lane aside. The official bicycle routes are aside, without much traffic by cars, but often up to 50% longer, and not so fast to ride (lot of curves). 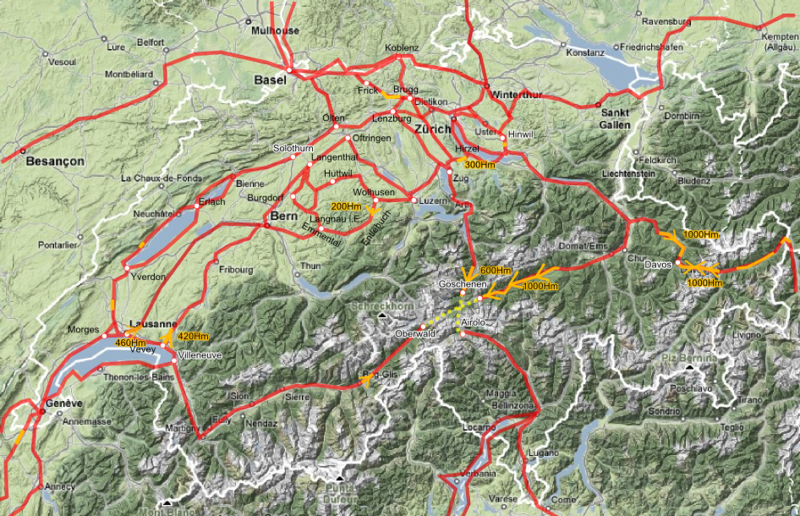 Usually I also ride flat routes, along rivers and lakes as you can see the map. Switzerland has 9 large bike trails No 1 to No 9, they are ideal for enjoying the ride and taking some vacation on the road with a bicycle, but aren't always as good to get from A to B, and better bike trails are available, for more information see Veloland.ch . 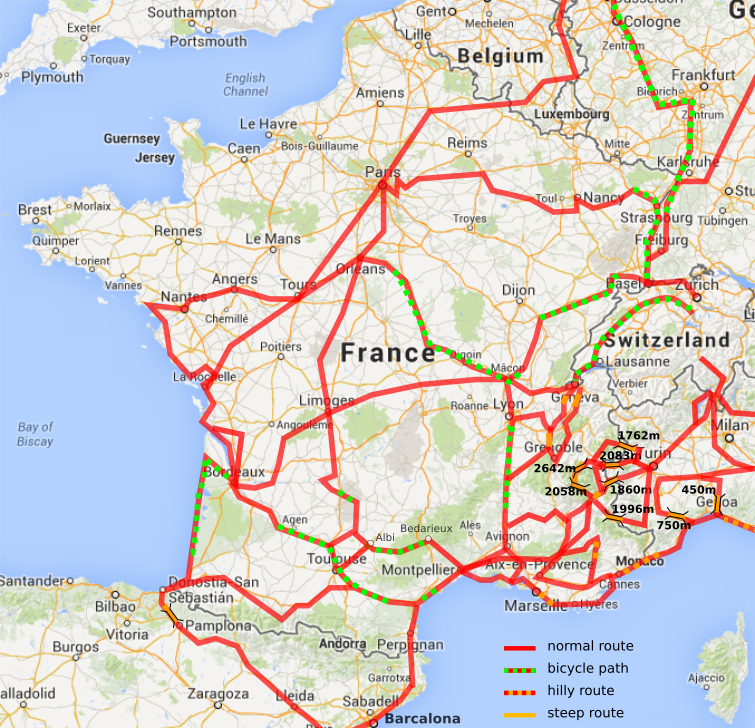 There is hardly a place you can't get with the bicycle in Switzerland, which is nice to know. As of 2008 there are now over 100 bicycle trails through entire Switzerland, additional to the main 9 routes. If you care to ride Switzerland, purchase the "Generalkarte 1:300,000" which is the best as it has topological detail information, don't buy the official "Veloland Schweiz" by Kümmerly + Frey map as it may illustrate the official bike trails which are signalized quite well themselves, but it gives you almost no information of climbing elevation details; it only gives you >> indication for hard climbing and is missing smaller roads suitable for riding with the bicycle. Shopping: Mo-Fr 8:00-18:30, Sa 8:00-16:00 (17:00), at larger railway stations Migros, Coop and Aperto exist which have open also Su. Backeries open 6:30 or 7:00 and some have open Su morning as well. 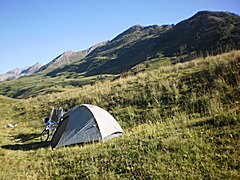 Wild Camping: considered suspicious behaviour but mostly tolerated, best spots are near forests, at or after sunset pitch your tent, or ask owner/farmer of the land beforehand which is appreciated, WC: "dig a hole with a small shovel, do your business, cover hole with earth/dirt" as all wild camper do. 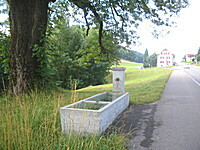 Water: in swiss-german part almost every village has a well with drinkable water to fill your bottles, swiss-french alike but less often, swiss-italian part rather scarce. 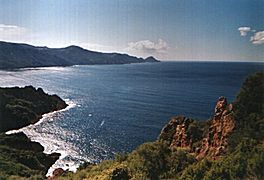 From Genua to La Spezia has two steep ascents, also less possibilities to camp in the wild, after La Spezia again more space. Along the meditarrean sea not many possibilities to camp in the wild, but many camp grounds. Beautiful route from the meditarrean sea to Lucca, Florence, and then Passo de la Muraglione - very beautiful. Roma is a nightmare with the bicycle, it's the worst city I ever rode, there are a few bicycle lanes, but hardly anyone rides bicycles in the city, it's simply too dangerous, much traffic in the east part of Roma. Genua is easy to pass through, lot of traffic during the week, and weekend almost empty streets. Florence is terrific to ride through by bicycle, narrow streets, lot of places to stay and site-seeing. Venice there isn't much to ride, put the bike aside and walk, but definitly worth a visit nevertheless, once in your life. Entry from Italy to Switzerland via Reschenpass, nice ascent from Bozen, then Martina (Switzerland), and steep and long Fluelapass (apprx. 1:45-2:15 ascending), descending down to Davos. Entry St. Gotthard, flat part to Erstfeld, then light ascension to Wassen, then more climbing to Göschenen, then either take the train to Airolo through the tunnel, or go over the pass, be aware of winter season (November to May) when the St. Gotthard pass is closed and you have to take the train. From Airolo light descension into Leventina, exit to Italy via Chiasso and Como, direction Bergamo very hilly and immense traffic, to be avoided. 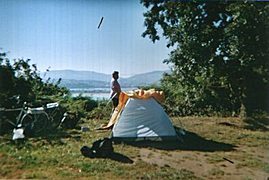 Rather follow Lago Maggiore and the Ticino river to the Po river, low traffic and good places to camp in the wild. 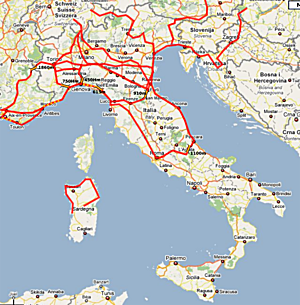 A beautiful ride is from Venice along the river Tagliamento on small roads to Travisio in the north east of Italy, reaching rather flat Villach, some of the passage is a fully developed bicycle road; otherwise Brenner or Reschenpass are other options to connect to Austria from Italy. 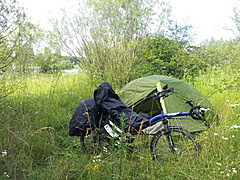 To cross the France it's very wise to travel along rivers, the Eurovelo route no 6 just does this, it starts in St. Nazaire and goes along the Loire, and Saone, and Canal du Rhone au Rhin reaching Basel, almost the entire route being flat and along river and canals. 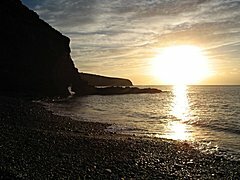 The route from Bordeaux to Biaritz along the coast is terrific, and many possibilities to camp in the wild - at high-season (June-August) most camp grounds are full, be aware. 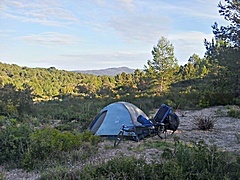 Route from Sete to Marseille along the meditarean sea coast is beautiful, lot of possibilities to camp in the wild, Camargue. After Marseille is no more flat but quite hilly for a while with multiple ascents, afterwards even bicycle trails to Nice, then slow traffic to Monaco and Genua as most traffic is on the highway. 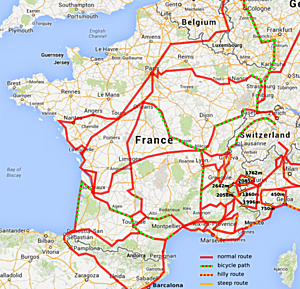 East / West from Geneve to Limoges, Bordeaux, the east side is hilly and therefore slow to ride. Canal du Midi or Canal des Deux Meres, from Bordeaux to Toulouse and finally reach the meditarean sea at Beziers following the canals is very nice as well, and at some passages provides useful features, e.g. from Toulouse going south-west along the canals water wells exist for bicycle riders, whereas in departement Aude just before Carcasonne the bicycle road is neglected completely. Paris is most beautiful and a joy to ride with the bicycle, it might be hard to get into the center of Paris passing through all the suburbs which seamless connect to Paris itself, once you are in there is a lot to explore, most beautiful city I saw in my life; leaving the city by bicycle is as hard as entering the city avoiding highways and such, detail map of the city required. Marseille is worth to pass through, best along the coast, then you enter the city go on the large Boulevard St. Michelet which becomes Avenue du Prado, that road leads to Cassis then. 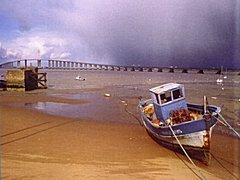 Bordeaux is difficult to pass through, as most signs show highway to the atlantic - another option is keep riding north in the city, til you almost left Bordeaux and watch cycling signs, go that bicycle path which leads to the atlantic without any car traffic, but is 15km longer than direct route. 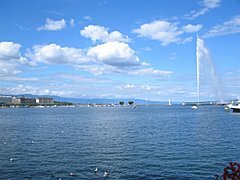 Entry from France to Switzerland over Basel/Bale is flat, via Bourg en Bresse and then Geneve has two ascents; via Viry/Frangy (without passing through Lyon) also flat reaching Geneve, also a way to ride down the rhone-valley, with a lot of industry (not that beautiful) but fast reaching meditarrean sea. 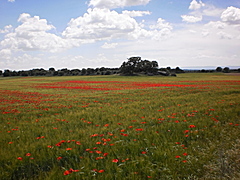 Passing Avignon at weekends as it has almost no traffic, otherwise try to ride around Avignon. 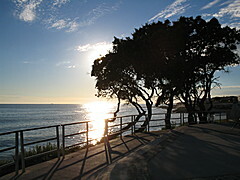 I rode along the coast most of the times, from Genova to Nice - mostly flat, with a few step short hills to do, e.g. 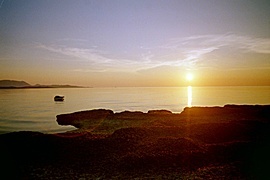 around Imperia as example. The border crossing around Menton is mostly flat, just after Menton direction to Nice a few tunnels and up and down around Monaco until you reach Nice, when it gets flat along the coast again. Another crossing I did was Briancon (1300m), which can be reached almost steady climing, except one steep section at L'Argentierre La Bessee. The real heavy climb comes after short before you reach Col de Montgenevre (1860m), a 500m climb over 7km with 8-9% steepness. The climb from the italian side is hard as well, 8-9% from Cesana (1350m) up. I rode Col de Montgenevre at a national french holiday with low traffic, but I was told quite many trucks otherwise drive that pass. 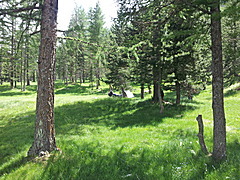 For an alternative also via Nevache and Col de l'Echelle with 1760m, which is ca. 100m lower than Col de Montgenevre and less traffic - from the italian side very hard climb from Bardonecchia. Northeast has many bicycle roads and lanes, almost every street from town to town has a bicycle lane as well, with good signalization. East germany the roads are all newly made and well for riding, yet, many farmer roads, also newly built, lead parallel to main roads yet are not signalized - unfortuntely. South germany, Bavaria and Badenwürtenberg have good bicycle roads, yet, dedicated maps are required to decipher where they start and lead to, as local signalization isn't sufficient. 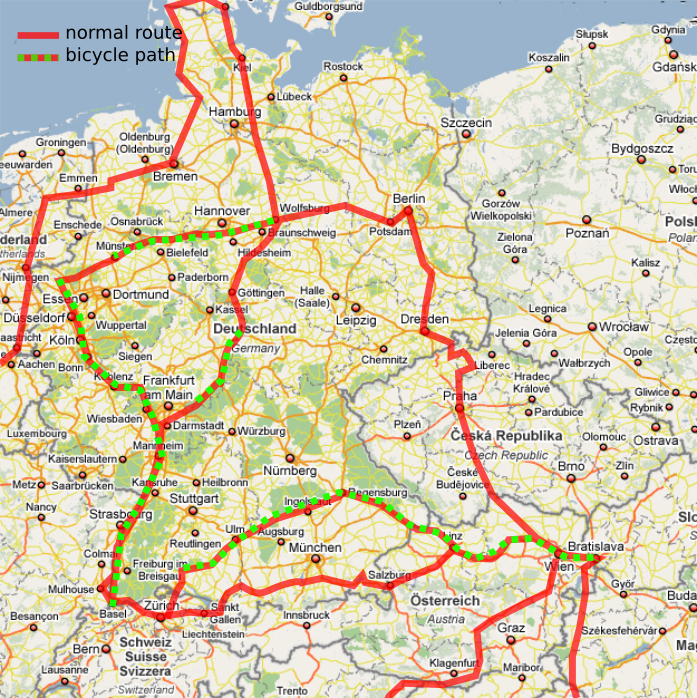 Berlin is worth to ride, approaching it from west from Potsdam follow B1, once you read city border follow B1 or the local bicycle signs "Mitte" - be aware from the border of the city to the center over 27km, it took me 2 hours. 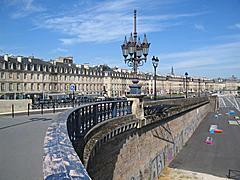 Once you are in the city most attractions are well signalized for pedestrians and bicycles. Leaving Berlin via B96 toward south, e.g. 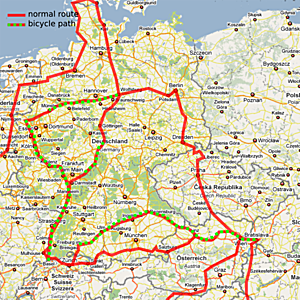 to Dresden is recommended, yet, the first 20km of B96 outside Berlin is a car-only highway, and one has to ride through small villages parallel to B96 - once the B96 reaches the Berlin Highwayring it becomes rideable for bicycles and leads to Dresden. German cities have often bicycle lanes and are well signalized for bicycles as well - unfortunatly Schleswig is not part of that list, really bad signalization in general, but in particular for bicycles. Rendsburg you can use the pedestrian tunnel to ride under the Nord-Ostsee Kanal/North-Eastsea Channel, use the elevator to reach the tunnel. In general the east part of Germany is nature-wise very beautiful and recommended. From Dresden you may take the Elbe bicycle road almost to Prague, unfortunatly the road isn't always that close to the river, e.g. at Königstein rather take normal street. Shopping: Su most stores closed except backery, otherwise 8:00 to 20:00 for large supermarkets. Wild Camping: mostly tolerated, good opportunities, south Germany a lot of farming with less opportunities - reach for forests. The bicycle road no 2 leads from north to Prague, unfortunatly there are parts with gravel and even stairs - unbelievable. Approaching Prague/Praha from north take 603, that's most simple - leaving Prague I experienced as difficult, finally I rode via Jesenice and then 608 and then 3 to the south, yet, the 3 is very busy and not really recommended - after Tabor direction Wien/Vienna yet it becomes more soothing traffic wise and acceptable. 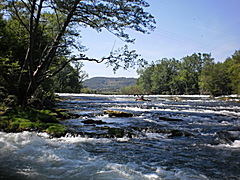 Czech Republic is nature-wise very beautiful, in particular the Elbe area and hilly region around Prague with forest. 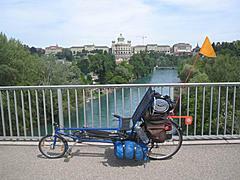 Approaching Austria from Prague you ride 4, until Pettendorf where bicycles are no longer permitted, ride to Tulln and reach the Donau Radweg / Danube Bicycle Road, there you ride either to Linz or Wien/Vienna. From Linz to Salzburg it's slightly hilly. The Donau Radweg / Danube Bicycle Road in the east is well maintained and easy to ride, particular Wien/Vienna is well signalized for bicycles. West around the Wachau is nature-wise most beautiful and recommended, yet, the bicycle road leads away often from Danube, before Linz the signalization isn't that good anymore - two provinces have their own number for bicycle roads, stupid. Via Salzburg (A), Chiemsee (D), Lindau (D), Bregenz (A) you may reach Switzerland without any passes.